From the A14 Adriatica highway, take the exit for San Benedetto del Tronto – Ascoli Piceno, go on along the highway towards Ascoli Piceno. After 800 meters take the Connection Porto d’Ascoli – Ascoli Piceno. Go on for about 13 km and take Castel di Lama exit, towards the SP1b; go on for about 200 meters on the right towards Via Mutilati ed Invalidi del Lavoro; at the circle traffic take the first exit towards SS4/highway Via Salaria; go on in SS4/highway Via Salaria for 328 meters and turn the left towards the SP106/San Silvestro. Go on for about 1 km and turn the left in Via Casale Superiore. The Hotel is on your left. San Benedetto del Tronto, at about 15 km, is the main train station; the other one is in Castel di Lama, 2 km far. Ancona-Falconara Airport, at about 120 km. 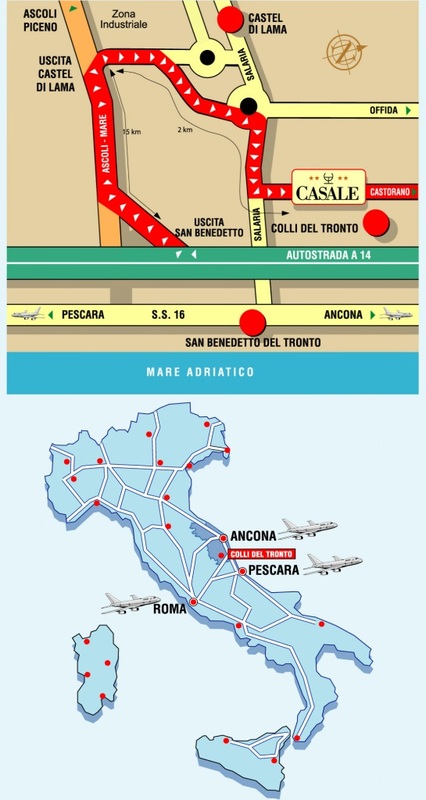 Airport in Pescara, 90 km far. Fiumicino Airport in Rome, at 250 km.